There is a commonly held perception among Irish construction workers that a Fianna Fail led Government in power is ‘good’ for the construction industry in Ireland. Fianna Fail is the traditional party of power in Ireland. There will be a general election in Ireland next Friday, and it is predicted that the current party in government, Fianna Fail, will be devastated. Fine Gael, who are the traditional opposition party in Ireland are predicted to be the main party in power after the election. With this in mind, I think it might be worth examining the idea that a Fianna Fail led Government is good for the construction industry more closely. A good indication of the level of activity in the construction industry is employment numbers. 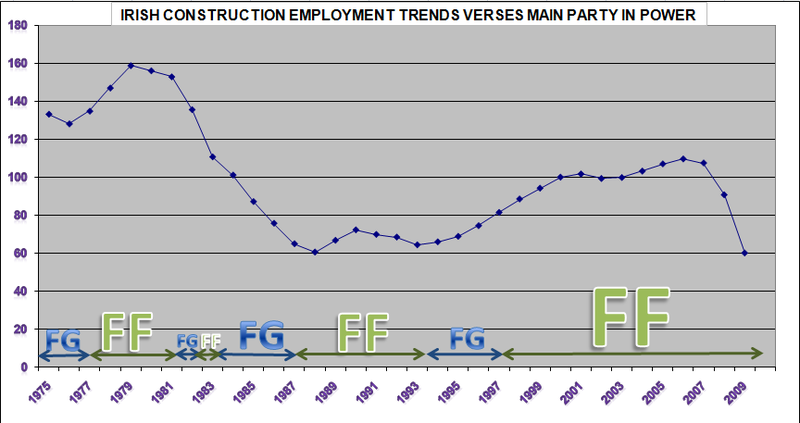 I used the Irish construction employment trend figures for the last 35 years from the Irish central Statistics Office website and compared them against who was leading the Irish government during the same time period. See graph below, the year 2000 is the base year with (trend) numbers employed then set at 100 and the years before and after related to this. Key: FG= Fine Gael, FF= Fianna Fail. Note: Smaller coalition parties have been ignored for clarity. The overriding feature of the graph is that the Fianna Fail party has been in power for the vast majority of the last 35 years and have been the only party which have held power for any substantial continuous duration of time. However, it is difficult to see any correlation to levels of employment/ construction activity. While Fianna Fail was in government during years of peak employment they were also in government during the two lowest points. The most interesting point from the graph would be that over 35 years, the point of transition from periods with growing employment levels to periods of falling employment levels (4 incidences in total) only happened when Fianna Fail was in power. Therefore, while Fianna Fail has been the dominant political party during the past 35 years in Ireland, it would be wrong to draw the conclusion that they are a necessary precondition for construction industry growth. Interesting post, but I think the chart is inconclusive as you say, to link construction activity with a particular party in Government. There’s a common line in most debates that Fianna Fáil have been the “builders party”. There is some truth in this primarily because there was a building boom from mid 1990s through to recent years. Governments will be reluctant to refuse audience with an industry that is growing and creating jobs. Similarly, such industries will back the Government party of the day. Why would they back opposition parties? That said, were Labour or Fine Gael to be in power from 1997 to 2007, I think they would most certainly have been dubbed the “builders party”. As also seen in US and UK, construction is often a get rich quick business. It’s a cash rich business too. Therefore many builders would have had plenty of surplus cash when business was booming. This surplus cash found its way into political parties as a way of maintaining pro-building policies. Important lesson now for future Governments is to spot bubbles early on and not to entertain them so much that they might become a detriment to that particular sector, or even the entire economy. Unfortunately though, it is difficult to turn down job creating industries, but hopefully we learn to at least get better at managing booms so we can better cope with recessions. Couldn’t agree with you more about trying to spot bubbles early on. Its probable that the next bubble won’t happen for a long time, and when it does the next generation will say ‘its different this time’. Hopefully the recent changes to our banking regulations will still be in force at that stage, they were expensive and hard won lessons.